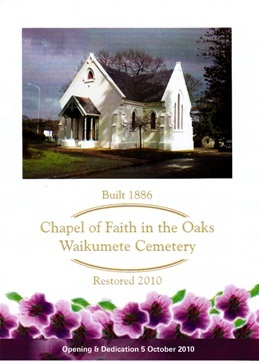 I was very honoured to receive an invitation from Friends of Waikumete to attend today's function, the reopening of the chapel. In March this year, I posted photos of the chapel during its restoration. The proceedings was led by a piper, and ministers from various faiths. Those present were led into the chapel, which was blessed. Speeches, of course. Speaking here is Councillor Janet Clews, with Mayor Bob Harvey of Waitakere City in the middle. A plaque was unveiled inj memory of Mary Gilligan. Artist Ray Blomfield standing proudly by his painting of the chapel. Another plaque, this one for the reopening itself. Now, back in March, I took a photo of the old street sign for the chapel. Below, some interior shots of the chapel. I have no idea what this is called in Maori, but it was used to bless the chapel. awww yes indeed thanks you for sharing! It has come up splendidly!!! I'd be delighted to come. Good time of the day for a trek! Cheers. I've asked at the Friends of Waikumete Cemetery Facebook page about this, to see if there is a list. "There were a huge number of ashes, Lisa, the chapel was full of them when the first restoration was done, I have been taking details as I go through the records. It would have been totally impossible to do a plaque. I suspect that the cemetery office will have such a list the ph # is 818-5615. Cheers."